We've all seen the news articles about exploding e-cigs. Its published so often you'd think you were taking your life in your hands every time you hit the go button on your eGo. Of course, we all know that isnt true, but fires and explosions do happen. And they happen for a variety of reasons. There are three parts to your eGo e-cig system, all of which are required to charge it, and any of which may fail and/or cause fires. They're electrical devices. They can fail. The standard eGo style battery contains a small circuit board which may or may not contain a battery charging circuit, depending on the manufacturer. It has no vent holes to exhaust the hot gases should the internal battery go into thermal runaway - a process where a stressed battery heats up, which further stresses the battery leading to more heat in a feedback cycle that leads to catastrophic failure of the battery. The principle method of protection should this happen is by the base cap, the metal or plastic end of the tube at the bottom of the device which is press fitted into the tube, and is designed to pop off under pressure to relieve the build up of gases contained in the tube. As this relies on the correct manufacture of the press fit, and as some manufacturers are better than others (never buy cheap, people!) this can sometimes fail to pop out, leading to a build up of pressure in the tube which can eventually fail, exploding outwards quite dramatically. There are 3 types of charger generally used for this sort of e-cig. Firstly, you get the small type that plug directly into your USB port, which are typically designed and supplied for charging cigalikes. The next two look virtually identical, with a USB plug, a length of wire, and the small charger box on the end onto which you screw your device. The difference is in the current rating of the devices - one type will supply typically 120mA, the other will supply typically 420mA. The lower current rated charger is intended for charging cigalikes and very low capacity eGo batteries. The higher is for your everyday >600mAh type eGo. Some may have charging circuits in them, intended for batteries that do not, others may not have those circuits and rely on the battery to regulate the charge. The chargers have a USB plug, and connect to a suitable USB port. Normally this would be a "wall wart" type power supply which plugs directly into your mains socket, however you can also connect them to anything with a USB socket. 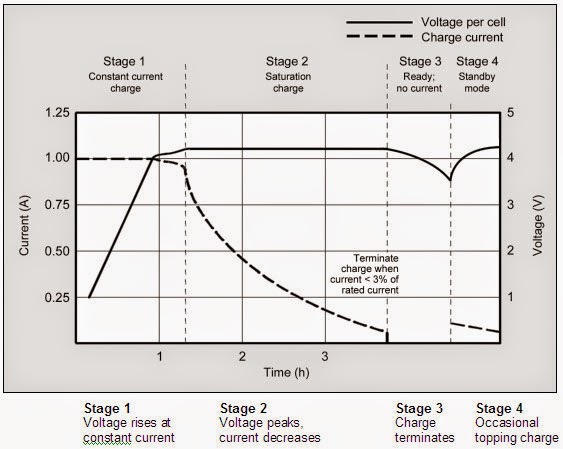 As your battery and components have a certain resistance, varying the input voltage will change the supply current, and this is what is provided to the battery at stage 1. The charger varies the voltage to maintain its rated supply current. Once the charge in the battery reaches a certain level (determined by the charger), it switches from constant current mode to constant voltage, so now the charger is supplying a fixed voltage to the battery with a varying current. It will monitor the current drawn by the battery until it reaches a set level, typically 0.1C or 10% of the capacity of the battery, at which point the battery is fully charged and the charger circuit will cut off (stage 3). If left connected to the charger, it will periodically give the battery a small top up charge to keep it up to spec (stage 4). Bearing this in mind, consider our system. If you have a 180mAh cigalike, and you screw it in to a charger that is going to supply a constant current of 420mA, the chances are high that your battery will fail and/or explode as the charger will be supplying a higher current than your device can handle. The little cigalike batteries typically don't have a charge control circuit, and would be unable to regulate the supply down to a safe level. If you plug a battery that has no charge circuit into a charger that also has no charge circuit, you're going to be applying an unregulated voltage to your battery, which may cause it to fail catastrophically. If you plug a charger with a circuit into a battery with a circuit, well, you're probably going to be okay, but I still wouldn't advise it unless that was the charger the manufacturer specified! Now this is where most people stop. They dont consider the third variable in the system, the supply. The power supply is just as capable of failing catastrophically as either the battery or the charger, and for the same reasons. Overloading a power supply by attempting to draw more power from it that it is rated to supply will cause the unit to heat up and can cause melt downs and fires, the same as any other piece of overloaded electrical circuitry. USB is a set standard that includes not just the shape and pinout of the connector, but also the current demanded from the devices that will be connected to it. It has also gone through several revisions, each of which has increased the current rating of the port. Great, right? Unless you happen to have a supply that is specified to the lower standard, and are expecting it to be able to safely supply a much greater current than that for which it is designed. The unit will overheat, and eventually fail, potentially in flames. USB 1, the original standard, set a maximum unit load of just 150mA - just 0.75W. USB 2 raised it to 100mA per load, with up to 5 connected loads, giving a maximum supply current of 500mA. USB 3 raised it again to 150mA per load, with 6 loads, giving a maximum of 900mA. Connecting a charger that is designed to give a constant current output of 420mA to a supply socket that is designed to deliver a maximum of 150mA would overload the supply port causing overheating, and may lead to, you guessed it, an eventual failure and/or fire. Your charging system is just that - a system. If one part of your system is stressed or over loaded, the entire system is likely to fail, and the stressed part of it may fail catastrophically. You need to ensure that your eGo battery is connected to the correct type of charger and that the charger is connected to the correct power supply unit. If you mix and match without knowing the exact specifications of each part, you are taking a risk, and that is something you do NOT want to do with lithium batteries. And eventually I come to the point of this article. USB may be a convenient and common connection standard, but when you are connecting devices to it that may far exceed the specifications to which your supply was built, you are playing - literally - with fire. And that is why I dont think the USB connector is a suitable standard for this application. If a dedicated connector was designed for each class of device, then only those devices that required that type of charger/supply would be able to connect to them. This would massively reduce the risk associated with e-cig charging, and might even get the press off our backs for 5 minutes. Whilst I have made every effort to ensure that the information contained in this post is accurate, it is your responsibility to ensure that the equipment you use is safe, and is operating within its specifications. If in doubt, contact the manufacturers. Do not sue me if your house catches fire. I'm broke, you wont get anything anyway.